Cleaning trash cans and deodorizing recycling bins are not fun or exciting chores, but they are necessary to keep our families healthier and avoid pinching our noses every time we need to throw something away. Fortunately, cleaning, deodorizing and disinfecting your bins can be accomplished quickly, efficiently and inexpensively by using this step-by-step guide. 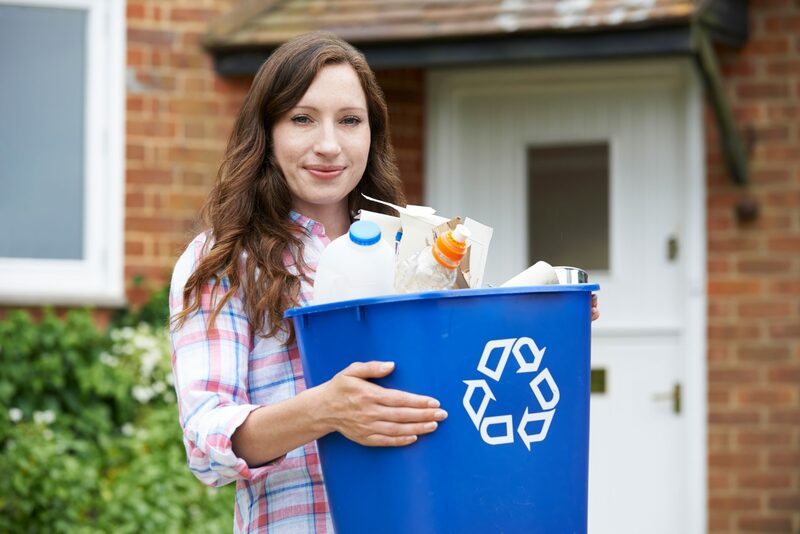 Since recycling bins generally only house recyclables, they usually do not get as dirty as trash cans. However, they can get quite sticky from soda or juice and quite smelly if your recycling includes beer cans or bottles. Because these bins are usually only soiled with liquids and, therefore, are easier to clean, we will start with how to clean, deodorize and disinfect recycling bins. The first thing you need to do is empty the bin or trash can you use for recyclables. The next step is to spray the inside of the bin with water. If you have a pressure washer, this is a good time to bring it out and make this step even easier. 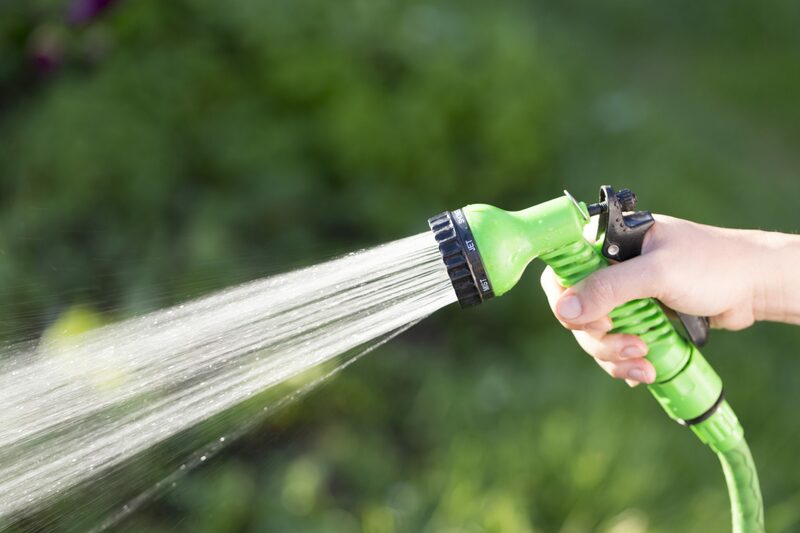 If you do not have a pressure washer, you can use a hose with a spray nozzle. This should remove most of the stuck-on liquids on the interior surface. If you are cleaning your bins on concrete, paving stones or bricks, be particularly careful when using a pressure washer. If the pressure is too high and you accidentally spray one of these hardscapes, you can cause visible damage. It is now time to assess the situation and see if simply spraying out the bin was enough or if the inside needs to be scrubbed. If a bit of scrubbing is needed, you have a few of options. First, you will need to decide which cleaning solution you would like to use. You can partially fill the bin with water, and then add a small amount of dish soap or a cup or two of distilled white vinegar (depending on the size of your bin). If you choose one of these options, you can then use a handled brush – like a deck brush – to scrub the inside and outside of the bin. If the bin is particularly dirty, you can also make a paste of baking soda and water to use as a mild abrasive. Rinse well after you are finished scrubbing the bin. Keep in mind that vinegar is an indiscriminate vegetation killer (which is why it is great for killing weeds). Therefore, if you are using vinegar, be sure that the runoff from rinsing your bins will not reach desirable plants or natural grass. If you chose the distilled white vinegar option for step three, you can combine these two steps by partially filling the bin with water and a cup of vinegar, spraying the inside of the bin liberally with undiluted white vinegar, and then closing the lid and leaving it alone for at least a couple of hours. You can then scrub the bin with the handled brush and rinse it thoroughly. If you cleaned the bin with dish soap or baking soda, you can simply spray the inside with undiluted distilled white vinegar, wait a few minutes and rinse with clean water. The distilled white vinegar will both deodorize and disinfect your recycling bin. Alternatively, you can deodorize and disinfect the bin with a commercial product, such as Lysol. Once you have completed the above steps, the only thing left to do is allow the bins to dry before putting them back in use. Prior to cleaning trash cans, you must first remove any trash bags or loose trash in the bin. In order to avoid touching trash and refilling your newly clean can with the same dirty trash, you may want to wait to clean your trash can after your regular garbage pickup day. If there are large items stuck to the sides that are easy to remove, go ahead and remove those now. You may want to wear gloves for this. 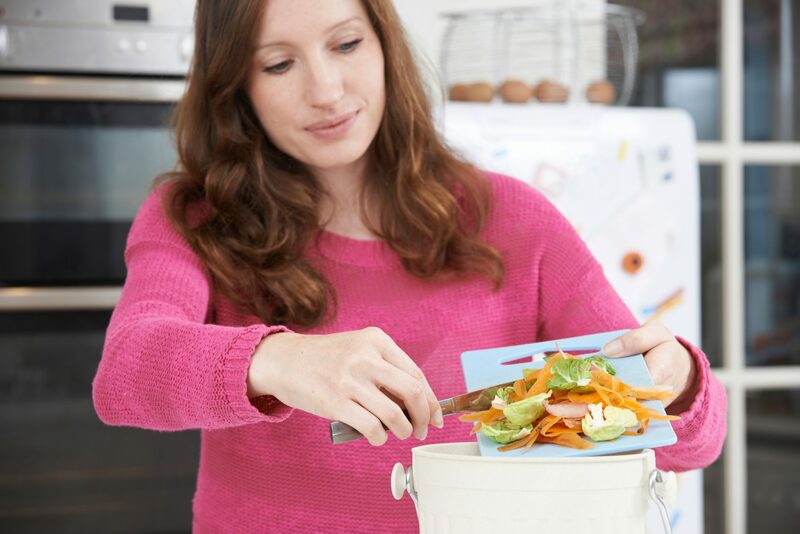 If the trash is at all stuck to the sides or difficult to remove, simply move to step three. Spraying out your bin will help loosen stuck-on items and prepare the surfaces for a good scrubbing. As with cleaning recycling bins, you can use a pressure washer or a hose with a spray nozzle for this step. Again, be careful when using a pressure washer near hardscapes, such as concrete, bricks or pavers. Trash cans can get pretty dirty, so simply spraying it out is probably not enough to really get it clean. You will want to fill about one-quarter of the can with water, and then add dish soap or one or two cups of distilled white vinegar. You can then use a handled brush to scrub the bin. If a more abrasive cleaner is required, make a paste with water and baking soda to use with your scrub brush. Rinse with clean water when the bin is satisfactorily clean. To disinfect the bin, you can either spray the bin’s surfaces with undiluted distilled white vinegar or a commercial product, such as Lysol. Both of these options will also deodorize the bin. If you choose to use white vinegar, you will want to rinse the bin with clean water or wipe it down with a rag after allowing the vinegar to sit on the surfaces for a few minutes. You can also deodorize the bin – but not disinfect it – by liberally sprinkling baking soda in the bin and leaving it to allow it to absorb the odors. Once you have completed the above steps and are satisfied with the cleanliness of your trash cans, allow them to dry before adding any of the elements mentioned below to ward off future odors. 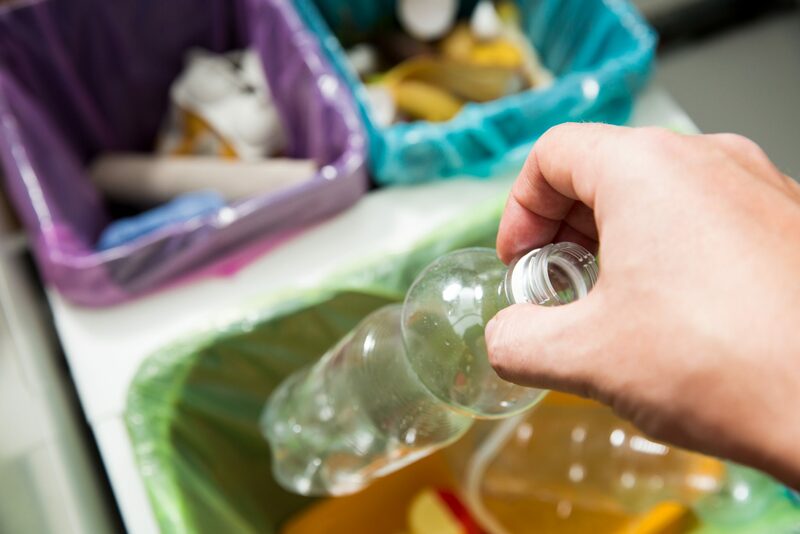 To help keep your recycling bins cleaner and make it easier to clean them in the future, rinse your recyclable cans and bottles and let them air dry before putting them in the appropriate bin. Keeping your trash and recycling receptacles in a shady area can help keep the contents from warming up as much and causing excessive odors. 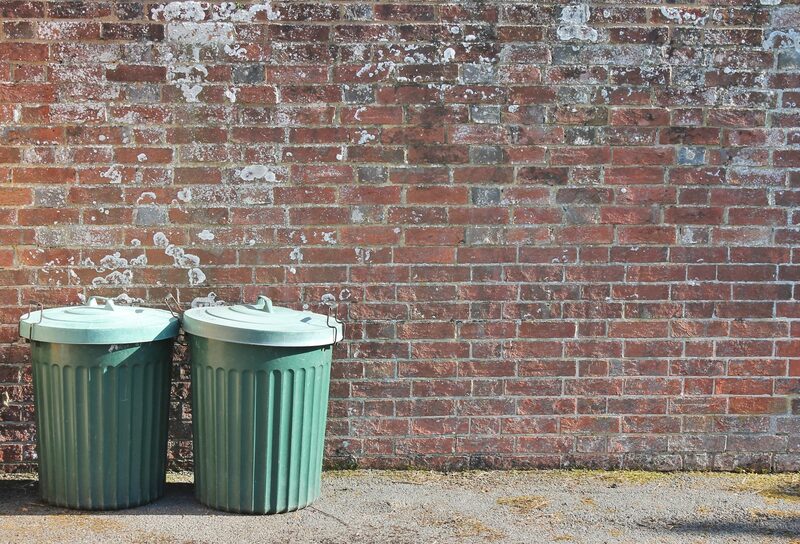 Keeping your bins in an enclosed area, such as a shed or garage, can cause the area to retain odors. If possible, keep your bins outside. You can take steps to hide them with a privacy screen or hedge. Start a backyard compost pile or bin for kitchen scraps, paper and cardboard. This is better for the environment, good for your garden and helps you keep rotting food out of your trash can. Sprinkle baking soda in the bottom of plastic trash cans to help absorb orders. This can cause corrosion in metal trash cans, but you can make a baking soda sachet with a coffee filter and twine to use in metal cans. Place a few drops of essential oil on cotton balls and place them in your garbage can to ward off unwanted odors. Place dryer sheets in your trash can to keep them smelling fresher. Odor-masking and odor- elimination disks can be attached to the inside of your trash cans or recycling bins to ward off odors. These disks are widely available in the cleaning product aisle at grocery stores and home improvement centers. Keep in mind that anything placed in trash cans that are mechanically dumped into garbage trucks will be lost, so you will need to replenish your baking soda, cotton balls or dryer sheets each week after trash day. What is your favorite way to avoid trash can odors? Share it with other readers in the comments below!